Franche Comte on the East of France is a small region close to Switzerland and Germany. The region is sparsely populated and 44% of it is covered in forests. Nestled between the Vosges mountain range in the North and the Jura mountains in the South, the region contains pine forests, cultivation fields and ramparts. The Jura Mountains, though not comparable to the Alps, are the country’s major cross-country skiing area. The region Des Lacs has innumerable waterfalls, gorges and small villages with wonderfully decorated belfries. The valleys of Doubs and Coue are also popular with their timber houses along the river. The region was occupied in the 4th century B.C. by a Celtic tribe called the Sequani. It became a part of the Roman Empire in 52 B.C. when Julius Caesar defeated the Gauls. The region was conquered by the Franks in 534 A.D. In the 10th century several small countships joined together to form the Burgundy county, which later, in 1032, came under the Holy Roman Empire. The name of ‘Franche Comte’ or ‘Free County’ was first used in the official records in 1366. In 1384, the Duke of Burgundy Philip the Bold acquired Franche Comte through marriage and structured it in councils, with a parliament around Dole. In 1493, again due to dynastic marriages, it went to the Habsburgs under the treaty of Senlis, only to be passed on to the Spanish Habsburg in 1556. Franche Comte was invaded and devastated by the French in the Thirty Years’ War. Spain defended the region, but in 1665, Louis XIV claimed Franche Comte in his wife Maria Theresa’s name. After three years, the prince de Conde conquered it but was forced to return it to Spain under the Aix-la-Chapelle treaty. Another invasion was led in 1674, and the Saint Martin’s arch in Paris was erected to commemorate the annexation of Franche Comte by the 1678 treaty of Nijmegen. Anti-French feelings were strong util the 18th century, despite the region being given a parliament and a university. The administrative reforms of the 1790 saw the formation of departments in the region. In 1982 Franche Comte was brought back as an administrative region. 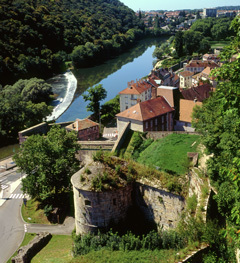 The town of Besancon in the Doubs department is encircled by the river Doubs. The popularity of Besancon lies in its several fortified towers, Roman arches, fountains and many churches, rather than in any particularly significant monuments. The Battant Bridge was built by the Romans to connect Italy with the Rhine Province. Among its five arches, the middle arch is about 13 meters (I looked in Wikipedia and it says the original bridge that had 3 arches was destroyed and now has only one. I don’t know which is right, but wanted to bring to your attention, so you can decide how to correct this sentence). The 16th century Granvella Palace has a massive arch entrance supported by 2 pillars and a wonderful arcade in the courtyard. The astronomical clock of Besancon built in 1858 has over 30,000 parts and 57 faces that provide an abundance of information, including tides and eclipses. The clock is listed in the National Monuments of France. The Royal Salt Works near Besancon was constructed by Louis XV as industrial buildings. These buildings have columnar classical design and are generally simple. Exhibitions on various themes are held here these days. About 30 km to the Southeast of Besancon is Lods, a village listed among the most beautiful villages in France. The Loue River valley is very popular among visitors with its ‘gorges de la Loue’ – a canyon formed through several years of river erosion. The valley is also sought for canoeing. The town of Pontanlier, which is on the border with Switzerland, is about 837 meters above sea level. The town’s 18th century Triumphal Arch is a huge stone structure, which marks it’s entrance. The arch commemorates the French seizure of the regions. Lons-le-Sauniere in the Eastern region of Franche Comte is notable for its streets, which radiate and spread out from a large open square. The streets have 17th century town houses lining them on both sides. The Archeology Museum here has the oldest dinosaur remains in France. Lons, noted for its public executions during the 19th century, has also been a spa town for centuries. Eight km from Lons-le-Sauniere is Baume-les-Messieurs, listed among the most beautiful villages of France. The Benedictine abbey of Saint Peter, which dates back to the 10th century, is a popular attraction. The village boasts beautiful unspoiled natural scenery and Cirque de Baume, where three splendid valleys meet, is a particularly notable sight.